And we're back! We apologize for the period of maintenance - we've been updating the site in anticipation of a slew of new arrivals that we hope to put live on the site for you in the coming weeks. Which has given us time to think more abstractly about the State of Cinema. Close to home the San Francisco Silent Film Festival kicks off a four-day run next week. 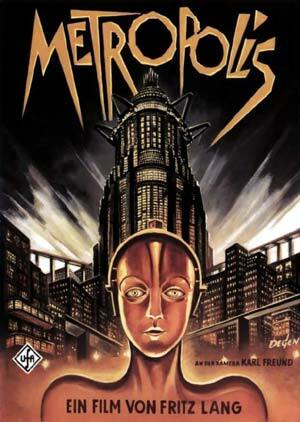 The good news is they're showing a spiffy digital print of a full restoration of Fritz Lang's Metropolis. The bad news for some is that this is a digital print - the Festival has prided itself on presenting restored prints throughout its history, and some believe that digital projection tarnishes the event. A while back I could understand the complaint, but given the high costs of shipping 35mm film (within the US, never mind domestically) and the increasingly sharp image that digital projection is capable of, this is a more than reasonable decision. As enraptured as I remain by the flickering of film images in a dark room, I've found myself just as taken in by several DP films in recent months. And there's something to be said for the ease of distribution that the digital format allows an important film like the deluxe METROPOLIS. Not to mention the preservation of the film. So I do wonder about people who claim you haven't really seen a movie unless you've seen it projected theatrically, on film. Actually I remain one of those people at heart, but find myself wishing that I was watching a DVD quietly at home rather than having a screening of a pristine print marred by a blabbermouth sitting behind me. Indeed, the "you haven't seen blah blah" crowd conveniently ignore the fact that many people live outside urban settings and may have minimal access to rep cinemas. Here in the states we're finding more and more that people are relying less on the Hollywood machine to program their thrills and are seeking alternatives either in rep houses or online. (Film Comment noted the high placement of Un prophète in their annual readers best-of poll, and attributed the high placement of the film, which released in few US cities, to its availability online). One of the great things about working at Jaman has been meeting people whose interest in cinema is inversely proportional to the size of the community they live in. What constitutes truly seeing a film isn't a debate that will be settled with a single blogpost - we're still seeing where technology takes us and what communities will form in and around it. For further reading: Jonathan Rosenbaum's insightful piece on the changing nature of cinephilia. Hope you find something of quality to watch this weekend, either here or out and about. In the interests of community, pop by our Forums and tell us about it!